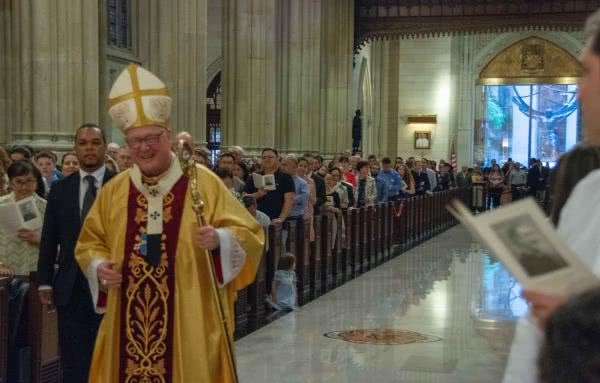 Transcript of the homily given by Cardinal Timothy Dolan on June 26, 2018 in St. Patrick’s Cathedral, Manhattan, for the feast of Saint Josemaria. I’m very familiar with the good work of priests in spiritual direction and serving as confessors. I’m gratefully aware of your apostolate at St. Agnes Parish, right smack-dab in midtown Manhattan. St. Josemaria would be happy. And I’m just so gratefully aware of the silent day-in, day-out witness that all of you give to the pursuit of holiness, the response to the universal call to holiness in the apostolate of your work. 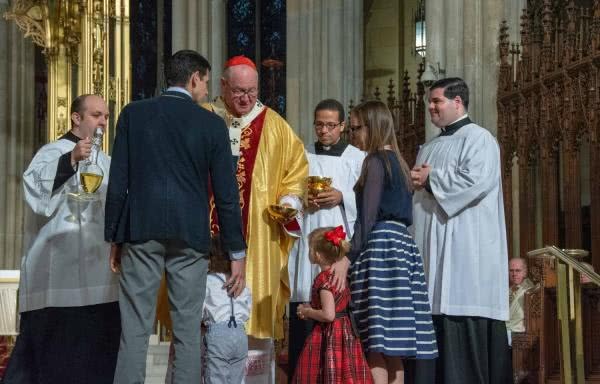 So I thank God for the gift that you are to the Church universal and in a particular way, here in the archdiocese of New York. We’re blessed to have this beautiful Gospel reading that Fr. Bohlin just proclaimed, and I think you will agree with me that this Gospel episode from St. Matthew’s Gospel very much capsulizes the extraordinarily rich insights that St. Josemaria Escriva left to the Church. Let me just mention four of them, four of them from this evening’s Gospel, that I think you will agree arise in the charism of St. Josemaria and Opus Dei. Number one would be the mandate that Jesus gave to the Apostles in the boat: “Cast out to the deep.” The Latin: Duc in altum, cast out to the deep. Like many phrases of Jesus, that has a literal meaning, and that has a symbolic meaning. The literal meaning obviously was Jesus telling Peter and the apostles, “Get out there! There are fish out there all right!” The spiritual meaning is deeper. And the Fathers of the Church and your founder saw that mandate of Jesus to “cast out to the deep” as the call, the call to plummet to the depths of the soul in the pursuit of perfection. Deep, deep down within us dwells the most Blessed Trinity. Deep, deep down within us is the very life of God in sanctifying grace. And when Jesus tells us to cast out to the deep, he means pursue perfection. Pursue sanctity. Look into the depth — there’s where the “deep” is — look into the depth of your soul and nurture there the flame of God’s life within. Cast out to the deep: the call to perfection. I was very moved a couple weeks ago at a meeting, a meeting in Washington D.C. [with] Archbishop Jose Gomez, the Archbishop of Los Angeles. It was a meeting to bring together divergent thoughts or movements in the Church in striving for unity, and Archbishop Gomez very powerfully said, “Look we are all called to be saints. And that pursuit of sanctity, that desire to be a saint, is what brings unity to all of us.” All of us. Archbishop Gomez knew what Jesus was talking about. Archbishop Gomez knows what St. Josemaria meant. 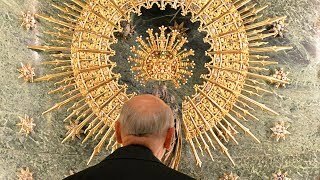 Remember when Pope Benedict XVI assumed the chair of St. Peter? It was his first address as bishop of Rome, and the world was expecting was expecting an extraordinarily cerebral and erudite sermon from this towering intellectual. And Pope Benedict XVI captivated the church and the world when he said simply, “I call you to holiness of life, which means friendship with Jesus.” [repeats] I call you to holiness of life, which means friendship with Jesus. There’s number one: Cast out to the deep. Number two, a second conclusion from the Gospel that rings true in the teaching of your founder: those apostles responded — somewhat reluctantly — responded to the mandate of Jesus to cast out to the deep in their work. He called them as fishermen to do their jobs. Cast out to the deep: that was their work, that was their occupation, they were fishermen. And he sanctified that work, that vocation, because it became the agency of a miracle, in the miraculous draught of fish. So did St. Josemaria encourage all of us to find sanctity, to cast out to the deep, not in some exotic apostolates, not just in faraway missionary lands, not just in cloistered convents, or sanctuaries of cathedrals — no, to cast out to the deep, to pursue perfection, to go after sanctity in our professions, in our work, in our labor. An insight that seems so simple that it is downright profound. So he, anticipating the great teaching of the Second Vatican Council, would be the poet of the universal call to holiness. Everyone is called to holiness and sanctity, everyone is called to the pursuit of perfection, in whatever walk of life we find ourselves. Insight number three: the move to repentance. St. Peter was so moved by the miracle, St. Peter was so embarrassed by his initial reluctance, and his sluggishness in his obedience to the command of Jesus to cast out to the deep, that he fell in repentance at the feet of the Master. Leave me Lord, for I am a sinful man. Oh, how often did St. Josemaria call us to conversion of heart and repentance of life! How often did he recommended the examen [examination of conscience]; how often did he recommend acts of sacrifice and penance; how often did he encourage us to [go] to the Sacrament of Penance. He knew we were all like St. Peter at the feet of Jesus: “Leave me Lord, for I am a sinful man,” as we are, moved to contrition, to conversion of heart, and repentance of life. Like St. John the Baptist, whose nativity we celebrated last Sunday, it was Josemaria that prophetically called the world to the conversion that characterized St. Peter in this evening’s Gospel. And finally, number four. The Gospel ends with Jesus calling those fishermen, “Come, follow me.” Come follow me, words that the Church has always interpreted as the summons to discipleship, the invitation to discipleship. St. Josemaria would agree that that the premier vocation in the Church is the call to discipleship. First and foremost we are called to be disciples of Jesus. If we don’t have that, no other vocation makes sense. The call to discipleship. George Weigel, the celebrated biographer of Pope St. John PIII, tells the story that after he had completed his “Witness to Hope,” his magisterial biography of John Paul, as most authors he left the introduction to the end. So the book was done, most of the work was over, but he didn’t know how to title the introduction. He said, “What should I call the introduction?” and he said he wrestled with it for hours. He said: Should I call the introduction “the Pole,” since John Paul II exuded that sense of Polish identity? Should I call the introduction “The ThInker,” since Karol Wojtyla was such an astoundingly astute thinker? Should I call the preface, “The Philosopher, The Theologian?” Should I call the preface “The Priest”? Should I call the preface “The Bishop,” since he so cherished his years as archbishop of Krakow? Should I call the preface “The Confessor of Faith,” in his standing up with courage to Nazi and Communist atrocity? Finally, finally, finally, George Weigel came upon the answer: “I will simply entitle the preface, ‘The Disciple.’” The Disciple. Because first and foremost, Karol Wojtyla, John Paul II, saw himself as a disciple of our Lord and Savior Jesus Christ, the most important identity in his life from which every other description, charism, and vocation flowed. Josemaria, St. Josemaria, would agree. The primacy of discipleship. Those four points I hold up to you this evening, everybody, as we celebrate his feast in this most fitting way: Duc in altum, the call to interior perfection. The call to perfection within their work, their labors, their profession. The move to repentance of St. Peter, a model of us all, and the primacy of the call to discipleship.